Fungicide not fertilizer. Note there are many other brand names for the same active ingredient. Adapted from original article: Brunings, A.M., Datnoff. L.E. and Simonne, E.H. 2005. Phosphorous Acid and Phosphoric Acid: When all P Sources are not Equal. Florida Cooperative Extension Service, HS1010. Asha M. Brunings, graduate student, Lawrence E. Datnoff, professor, Plant Pathology Department; E.H. Simonne, assistant professor, Horticultural Sciences Department, Cooperative Extension Service, Institute of Food and Agricultural Sciences, University of Florida, Gainesville, 32611. While growers are familiar with phosphorus-containing fertilizer, the abundance of terms, which are deceptively similar (such as phosphoric acid and phosphorous acid), may create some confusion on the actual content and efficacy of these products. Some common phosphorus-containing compounds are listed in Table 1. Some claims found in commercial literature and product descriptions refer to phosphorous acid as a “supplemental fertilizer,” while others present it as a fungicide. The purpose of this article is to explain what phosphorous acid actually is and to examine its fungicidal activity and nutritional value. Phosphorus (abbreviated P) is one of the essential elements for normal growth and development of plants. In fertilizers, it is normally found in the form of phosphoric acid (H3PO4) (Table 1), which readily disassociates to release hydrogen phosphate (HPO42-) and dihydrogen phosphate (H2PO4-). Both of these ions may be taken up by the plant but H2PO4- more readily. Once inside the plant, both ions are mobile. The amount of phosphorus a fertilizer contains is represented as the middle number on the bag expressed as P2O5 (such as 5-10-15 where the first number represents the nitrogen percentage and the third number potassium percentage as K2O). The P2O5 unit used to represent P content in fertilizer is a conventional unit (in reality, there is little or no P in the form of P2O5 in fertilizer). Phosphoric acid should not be confused with phosphorous acid (H3PO3). A single letter difference in the name of a chemical compound can make a difference in its properties. Phosphorous acid releases the phosphonate ion (HPO32-), also called phosphite, upon disassociation. Like phosphate, phosphonate is easily taken up and translocated inside the plant. Phosphorous acid and its related compounds are often referred to as phosphonate, phosphate, and phosphonic acid. One of the breakdown products of fosetyl-Al is mono-ethyl phosphonite, which may be taken up by the plant. Inside the plant, fosetyl-Al may ionize into phosphonate, and therefore fosetyl-Al belongs to the same group of phosphorous acid compounds. Phosphorous acid does not get converted into phosphate, which is the primary source of P for plants. In contrast, some soil bacteria are capable of transforming phosphonate into phosphate. However, this process is so slow that it is of no practical relevance. To date, no plant enzymes have been described that could oxidize phosphonate into phosphate. This explains why phosphonate is stable in plants and does not get converted into phosphate. Since phosphorous acid and its derivatives do not get metabolized in plants, claims that phosphonate can contribute to phosphorus nutritional needs of the plants should be taken with caution. Phosphorous acid has properties useful in agriculture. As has been confirmed by other publications investigating efficacy of phosphorous acid against oomycetes, Förster et al. (1998) found that phosphite is capable of controlling Phytophthora root and crown rot on tomato and pepper. These authors also investigated the ability of phosphorous acid to act as a nutrient source for plant growth and found that P-deficiency symptoms developed when plants were grown hydroponically with phosphorous acid as the sole source of P (without phosphate). This means that although phosphorous acid can control oomycetes in a number of host-parasite systems, it is not a substitute for phosphorus fertilization. The inverse is also true: phosphate is an excellent source of P for plant growth but is unable to control pathogen attack by oomycetes, other than making the general health of the crop better, thereby improving its natural defense system. Therefore, no valid evidence exists for the claim that phosphorous acid improves plant growth. It is well documented that phosphorous acid is able to control diseases caused by organisms that belong to the Oomycota (or oomycetes) that are on agronomical crops. Oomycetes (a group of pathogens that include water molds and downy mildew) are actually not fungi but are frequently grouped with fungi, because they form structures (filaments) similar to the ones that fungi make. In reality, oomycetes are fungal-like organisms that differ from fungi in that their cell walls do not contain chitin but a mixture of cellulosic compounds and glycan. Another difference is the nuclei in the cells that form the filaments; each have two sets of genetic information in oomycetes (diploid) instead of just one set as in fungi (haploid). For most practical purposes, the oomycetes are grouped with fungi. Compounds that control plant pathogens belonging to the oomycetes are often called fungicides. It is important to distinguish between fungi and oomycetes; chemicals that are used to control one will often not be effective against the other, depending on their different biology. Several important plant pathogens belong to the oomycetes; the one with the most economic impact is Phytophthora infestans, which causes late blight of potato. Phosphorous acid has both a direct and an indirect effect on oomycetes. It inhibits a particular process (oxidative phosphorylation) in the metabolism of oomycetes. For instance, phosphonate compounds are ineffective against phosphonate-resistant oomycetes. In addition, some evidence suggests that phosphorous acid has an indirect effect by stimulating the plant’s natural defense response against pathogen attack. A major factor in the ability of phosphorous acid to control oomycetes for long periods of time appears to be its chemical stability in the plant. 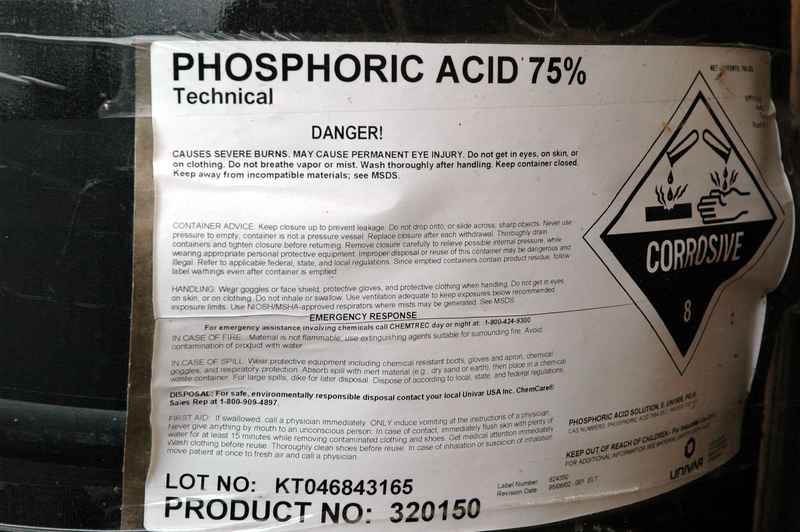 Phosphorous acid does not convert into phosphate and is not easily metabolized. The stability of the different phosphonate-related compounds may depend on environmental factors such as climate or crop type. Because phosphonate is systemic and stable in the plant, it should be applied infrequently. Plant species may differ in uptake and translocation of phosphonate, and there is great variation in sensitivity of individual P. infestans isolates to phosphonate compounds, which may negatively impact the effectiveness of phosphonate. Table 1. Agriculturally relevant P-containing compounds. The chemical element indicated with the symbol P that is important for numerous processes in all organisms. It does not occur as a free element in nature. Compound normally found in P-fertilizers. Partially disassociated form of H3PO4, in which P is most readily taken up by the plant. Partially disassociated for of H3PO4, in which P can also be taken up by the plant. Formula used to express P-content of fertilizers. Compound normally marketed as a fungicide. There has been a lot of research on phosphorous acid-related compounds and their efficacy against potato late blight. In most cases, research has been done with foliar applications of phosphorous acid. The compound gets translocated in the plant to the roots and is therefore effective against oomycetes that affect roots. Phosphorous acid was shown to be effective when applied as a root drench against P. cinnamomi, P. nicotianae, and P. palmivora in lupin, tobacco, and papaya, respectively. The efficacy of different phosphonate compounds against nine Phytophthora spp., which cause stem rot of Persea indica L. and pepper, was tested both as a curative and preventive method of control. Even though sensitivity of each of the Phytophthora spp. used in their experiments in the laboratory was variable, there was little difference in the ability of different phosphonate compounds to control the stem rot of pepper, as a curative or a preventive agent in pots. The level of control was better for Persea indica L. than for pepper. 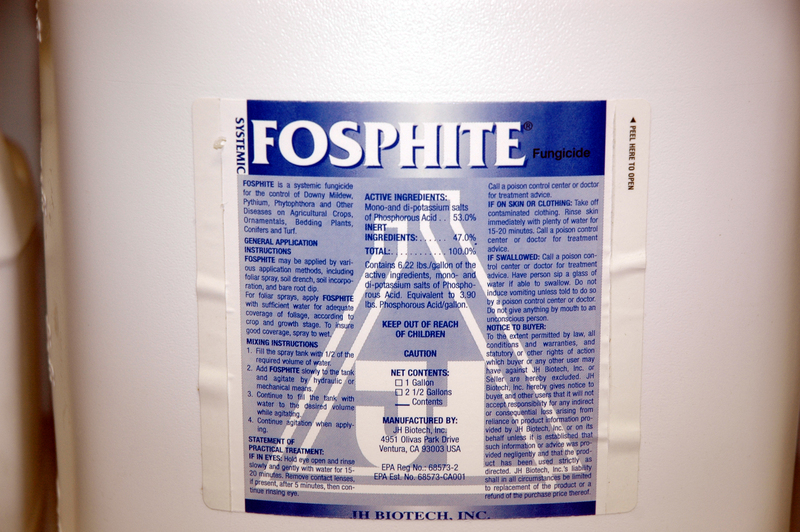 Fosetyl-Al is a systemic fungicide that is often used against root pathogens because it is mobile in the plant and gets transferred to the roots. It was found that foliar application of fosetyl-Al did not reduce tuber blight on potato caused by P. infestans, while foliar sprays with partially neutralized phosphonate reduced the number of tubers that developed symptoms after inoculation with the pathogen. Different host plants may take up, transport, and metabolize fosetyl-Al differently. This seems contradictory, since fosetyl-Al releases phosphonate as a breakdown product, but there may be other factors involved, such as environmental ones. In general, Potassium phosphonate negatively affected mycelial growth more than phosphonates that had alkyl groups, but some exceptions were noted. None of the compounds used were able to control infections by Phytophthora spp. completely when they were used as a curative or protective agent. All of the compounds were equally effective when used as a protective agent (by root dip). Potassium phosphite was shown to be effective for control of strawberry leather rot caused by P. cactorum. Phosphonate was shown to be effective when applied to potato foliage against P. infestans and P. erythroseptica (causal agent of pink rot) but not against Pythium ultimum (causal agent of Pythium leak). Phosphorous acid also appears very effective against downy mildew on grapes, and against Phytophthora root and crown rot on tomato and green pepper in hydroponic culture. For control of oomycetes on turfgrass, Riverdale Magellan (a mixture of phosphorous acid compounds) and Chipco Signature (Aluminum tris [O-ethyl phosphonate]) were found to be equally effective against Pythium blight development on perennial ryegrass (Lolium perenne). Similarly, different commercial formulations of phosphorous acid suppressed Pythium blight on rough bluegrass (Poa trivialis) during the 2001-2002 season. The existence of Phytophthora spp. resistant against phosphonate has been reported. Hence, care should be taken to alternate phosphonates with other effective compounds to prevent a buildup of resistant Phytophthora spp. in the field. A clear distinction exists between phosphoric acid and phosphorous acid: the former is a nutritional source of P for plants, and the latter helps control agricultural epidemics of oomycetes. Claims suggesting that either compound may fulfill the functions of the other are not supported by current literature and are therefore misleading. Since phosphonates are systemic and very stable in plants, they should not be applied frequently. To help control the phosphonate-resistant oomycetes described in this publication, care should be taken to alternate or mix phosphonate with other effective compounds. Bashan, B., Levy, Y., and Cohen, Y. 1990. Variation in Sensitivity of Phytophthora infestans to Fosetyl-Al. Plant Pathol. 39:134-140. Brown, S., Koike,S.T., Ochoa, O.E. Laemmlen, F., and Michelmore, R.W. 2004. Insensitivity to the Fungicide Fosetyl-aluminum in California Isolates of the Lettuce Downy Mildew Pathogen, Bremia lactucae. Plant Dis. 88:502-508. Coffey, M.D., and Bower, L.A. 1984. In vitro Variability Among Isolates of Eight Phytophtora Species in Response to Phosphorous Acid. Phytopathology 74:738-742. Cohen, Y., and Coffey, M.D. 1986. Systemic Fungicides and the Control of Oomycetes. Annu. Rev. Phytopathol. 24:311-338. Cooke, L.R., and Little, G. 2001. The Effect of Foliar Application of Phosphonate Formulations on the Susceptibility of Potato Tubers to Late Blight. Pest Manag. Sci. 58:17-25. Datnoff, L., Cisar, J., Rutherford, B., Williams, K., and Park, D. 2005. Effect of fungicides and other prophylactic treatments on Pythium blight development on Poa trivialis, 2004. Fungic. Nematicide Tests 60:T033. Dolan, T.E., and Coffey, M.D. 1988. Correlative In vitro and In vivo Behavior of Mutant Strains of Phytophthora palmivora Expressing Different Resistances to Phosphorous Acid and Fosetyl-Na. Phytopathology 78:974-978. Fenn, M.E., and Coffey, M.D. 1984. Studies on the In vitro and In vivo Antifungal Activity of Fosetyl-Al and Phosphorous acid. Phytopathology 74:606-611. Fenn, M.E., and Coffey, M.D. 1985. Further Evidence for the Direct Mode of Action of Fosetyl-Al and Phosphorous Acid. Phytopathology 75:1064-1068. Fenn, M.E., and Coffey, M.D. 1989. Quantification of Phosphonate and Ethyl Phosphonate in Tobacco and Tomato Tissues and Significance for the Mode of Action of Two Phosphonate Fungicides. Phytopathology 79:76-82. Förster, H., Adaskaveg, J.E., Kim, D.H., and Stanghellini, M.E. 1998. Effect of Phosphite on Tomato and Pepper Plants and on Susceptibility of Pepper to Phytophthora Root and Crown Rot in Hydroponic Culture. Plant Dis. 82:1165-1170. Griffith, J.M., Coffey, M.D., and Grant, B.R. 1993. Phosphonate Inhibition as a Function of Phosphate Concentration in Isolates of Phytophthora palmivora. J. Gen. Microbiol. 139:2109-2116. Helena Chemical Company. 2002. Helena ProPhyt. A Systemic Fungicide Containing Potassium and Phosphate. (promotional brochure). Helena Chemical Company. Johnson, D.A., Inglis, D.A., and Miller, J.S. 2004. Control of Potato Tuber Rots Caused by Oomycetes with Foliar Applications of Phosphorous Acid. Plant Dis. 88:1153-1159. McDonald, A.E., Grant, B.R., and Plaxton, W.C. 2001. Phosphite (phosphorous acid): Its Relevance in the Environment and Agriculture and Influence on Plant Phosphate Starvation Response. J. Plant Nutr. 24:1505-1519. Ouimette, D.G., and Coffey, M.D. 1989a. Comparative Antifungal Activity of Four Phosphonate Compounds Against Isolates of Nine Phytophthora Species. Phytopathology 79:761-767. Ouimette, D.G., and Coffey, M.D. 1989b. Phosphonate Levels in Avocado (Persea americana) Seedlings and Soil Following Treatment with Fosethyl-Al or Potassion Phosphonate. Plant Dis. 73:212-215. Smillie, R., Grant, B.R., and Guest, D. 1989. The Mode of Action of Phosphite: Evidence for Both Direct and Indirect Action Modes of Action on Three Phytophthora spp. in Plants. Phytopathology 79:921-926. Street, J.J., and Kidder, G. 1989. Soils and plant nutrition. UF/IFAS, Fla. Coop. Ext. Serv. Fact Sheet SL-8. Thao, H.T.B., and Yamakawa, T. 2009. Phosphite (phosphorous acid): Fungicide, fertilizer or bio-stimulator? Soil Science and Plant Nutrition 55:228-234.